The death toll from anti-government protests in Nicaragua has risen to 25 as the national police were accused of using live rounds against demonstrators. Those killed include Ángel Gahona, a journalist who was shot dead while presenting a live broadcast on protests in Bluefields, a town on the country’s Caribbean coast. Footage shows Gahona holding up a mobile phone as he approached the city hall, reporting live via Facebook on four days of protests in the Central American country. Seconds later a gunshot rings out and Gahona slumps lifeless to the kerb. Voices cry his name and someone presses a piece of cloth to his head to try to staunch the stream of blood. Footage of the incident quickly spread on to local and social media. The protests follow a new legislation that increased pension contributions for workers and employers and reduced overall benefits. 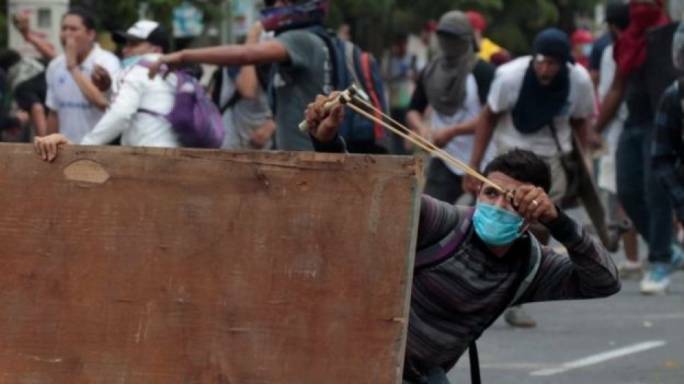 The violence began on Wednesday, when pensioners took to the streets in the capital Managua. They were joined the next day by thousands of students and workers. According to human rights groups, 25 people have died since 18 April in unrest over social security reforms planned by the government of president Daniel Ortega. At least 67 people have been shot by the police with live rounds or rubber bullets, or beaten by members of the Sandinista Youth and other pro-government groups. A further 43 people were reported to have “disappeared” over the weekend. Nicaragua's President Daniel Ortega has said his government is willing to review the pension reforms that have triggered the violent protests since they were approved on Wednesday. Ortega has offered talks, but business leaders have rebuffed him, saying police violence must stop first. "If in the talks we find a better way of carrying out these reforms, this decree can be amended or replaced by a new one," said Ortega on national television. Speaking to tens of thousands of people during his Sunday address in St Peter’s Square, Rome, Francis called for “an end to every form of violence” and asked people “to avoid the useless shedding of blood”.